Road speed limits have been set to improve safety, reducing both the incidence and severity of crashes and also possible variations in speeds, which can increase the number of accidents. Speed management provides a credible system of speed zoning which meets driver expectation while achieving a balance between road safety, mobility and land use. Appropriate and consistent speed limits are essential for this credibility. The limits must also be enforceable and sufficiently signed. "Those refusing to comply with speed limits either don't believe in the influence of driving speed on impact speed or just don't care at all. Due to this 'rejection front' it must be proven in every country that the laws of Isaac Newton are true." 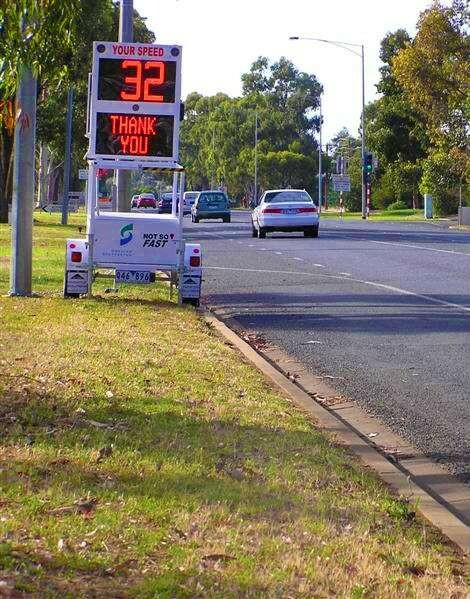 VicRoads are the responsible authority for all speed zone changes in Victoria. If Council believes a limit should be changed, an application is made to the VicRoads Regional Manager, accompanied by any supporting data. VicRoads assess the application using a system which promotes systematic and consistent application of speed limit guidelines throughout Victoria. This program suggests an appropriate speed limit, taking into account the road environment, road width, abutting developments, road users, existing speeds, accident history and adjacent speed zones. The application is discussed with Council and Victoria Police at regular traffic liaison meetings and a site visit is usually carried out before a final decision is made. Doyles Rd to 1.2km east of Lemnos North Rd 90km/h limit reduced to 80km/h. Works done by VicRoads. between Wyndham St and Hawdon St 60km/h limit reduced to 50km/h. between Balaclava Rd and High St 60km/h limit reduced to 50km/h. at Congupna Primary School LED speed signs added at time-based school zones. Works done by VicRoads. at Shepparton Christian Community School LED speed signs added at time-based school zones. Works done by VicRoads. Poplar Ave to south of Broken River 90km/h limit reduced to 80km/h. Works done by VicRoads. Murchison Violet-Town Rd to Ross Rd New freeway limit raised to 110km/h. Works done by VicRoads. at railway crossing 80km/h zone created around railway crossing. Works done by VicRoads. at railway crossing 90km/h limit reduced to 80km/h around railway crossing. Works done by VicRoads. north-east of township 80km/h buffer zone removed. Limit changed to 70km/h to match township limit. Works done by VicRoads. Drummond Rd to Doyles Rd 80km/h limit reduced to 60km/h, where median turning lane installed. Works done by VicRoads. west of Murchison Urban 60km/h zone extended 125m past Hammond Rd. 400m long 80km/h zone created. Works done by VicRoads. Cooma township 80km/h zone created through Cooma township. near old drive-in Speed limit changed from 60km/h to 50km/h. Feb-07 Various school locations Creation of some time-based school speed zones and alterations to some existing school zones. Jan-07 Echuca-Mooroopna Rd and MacIsaac Rd, Mooroopna 40km/h time-based school zones extended to include new bus interchange. south of Kiota Rd 80km/h zone extended south past Kiota Rd and River Rd. Works done by VicRoads. near Shepparton Aerodrome 70km/h zone extended 260m south. Works done by VicRoads. near Shepparton Cemetery 60km/h zone extended due to new subdivision nearby. southern entrance to Tatura 60km/h zone extended south to Hampton Road. Grahamvale Road to Lemnos North Road 80km/h hamlet zone created. east of School Road 80km/h buffer zone created. school frontage 40km/h zone created along school frontage. south-east of township 80km/h buffer zone created. Goulburn Valley Hwy to Kialla Tip Rd Reduction from 70km/h to 60km/h due to new subdivision. between Turnbull Rd & Mpna-Murchison Rd Creation of a 90km/h hamlet zone. south of Mitchell Rd Creation of 80km/h zone in dead-end section of Archer Rd. between Pauls Rd and Boundary Rd Creation of 100-60km/h time-based school speed zone for new Isik College. west of Echuca-Mooroopna Rd 50km/h zone extended and 70km/h limit introduced out to Charles St.
full length Limit reduced to 50km/h south of Brauman St and to 40km/h north of Brauman St.
John McEwen Reserve 20km/h AREA limit imposed over the whole reserve, including velodrome, showjumping and stadium areas. east of Perrivale Dr 60km/h urban limit extended to the east. Treacy St to MacIsaac Rd Limit reduced from 70km/h to 60km/h. west of Seven Creeks Dr 50km/h urban limit extended past bridge and 80km/h buffer zone created. Feb-04 Various school locations Time-based school speed zones (and some permanent zones) created around all schools. 2004 Stevenson St, Murchison 50km/h CBD limit created. Works carried out by VicRoads. Dec-03 Goulburn Valley Hwy, Congupna Limit reduced from 100km/h to 90km/h. Dec-03 Euroa-Shepparton Rd and River Rd, Kialla Central 90km/h limit created to correspond with 90km/h limit on Doyles Rd – River Rd bend. Pine Rd to Ford Rd Limit reduced from 80km/h to 70km/h. Wyndham St to Monash St Limit reduced from 60km/h to 50km/h. from 1km west of bend Limit reduced from 100km/h to 90km/h. Oct-03 Hawkins St, Shepparton Limit reduced from 80km/h to 60km/h. Kialla to Mooroopna Limit reduced to 60km/h from Kialla Tip Rd to Mooroopna. south approach from Goulburn Weir Rd 80km/h buffer zone created. Graeme St to McFarlane Rd Limit reduced from 70km/h to 60km/h. Mar-03 Murton Rd, O'Reilly Rd, Taylor Rd and Hampton Rd, Tatura Limits reduced from 80km/h to 60km/h. east section Limit reduced from 70km/h to 60km/h. For additional information on the national perspective visit the VicRoads website.